What can you do when your novel is too short? First, let's clear up what "too short" means for this discussion. Stories tend to be as long as they need to be, but what I'm talking about today are manuscripts that are aiming for a particular word count for a particular market and wind up short of that count, such as that 50K-word NaNoWriMo novel that needs to be 70 or 80K-words for the market you want to publish in. You don't want to add fluff words to hit your goal (smart folks), but you know the story isn't going to be marketable at the length it is. 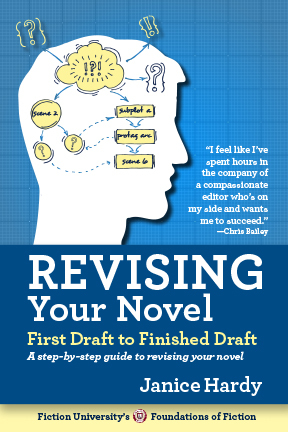 Before you do any revising, analyze the manuscript and determine if you have a sparse manuscript that needs some fleshing out, or a novel that's short on plot. A sparse novel may not need any macro work, while a short-plot novel will need some major additions. Is everything clear? Make sure the characters' motivations are solid so readers can understand why characters are behaving as they are. Check to see if the stage direction is good and readers can follow what's happening in a scene. Are the dialogue tags clear so there's no confusion over who is speaking? Also make sure there's enough back story to inform readers about the significance of events--often this gets left out because we're terrified of having too much. This is true for real worlds as well as crafted worlds. Have you done enough with your setting so the world feels real? Real word writers--have you used enough specific details to make your setting come alive? It's easy to say "New York" and let readers fill in the blanks, and then end up with flat and lifeless worlds. And if your world is created, then you might find some confused readers who feel ungrounded, especially if you used a lot of made up words for things. Are you in your point-of-view character's head enough? You know why your protagonist acts as she does, but are you getting that all on the page? Pretend you know nothing about her or her history. Are the things readers need to know clear? Short novels often have lots of action, but the emotional aspect is missing. And the flip side, are you in your point-of-view character's head too much? Are you telling or summarizing what's happening and not letting it unfold? Strange as it sounds, action scenes can be boring to write, so it's easy to scrimp on them to get to the more interesting emotional stuff. But it's the balance between head and heart that make the story work. Where are you now? Have you fleshed out enough to hit your word count goal? No? Then take the next steps. Basically, 1) Inciting event and first realization of the story problem. 2) The first major upset that shows the protagonist they can't fix this easily. 3) The realization that everything they've done is for naught and they're likely going to fail. 4) The decision to take the final problem head on. Each step requires multiple steps to get to, and the stakes will get progressively higher as you reach these steps. If any of them are skipped, that could be a reason why you're short. If you haven't skipped any, are there any events that might need a step or two more to accomplish? Places where if the protagonist didn't win, or things didn't go in her favor, you could tack on a scene or two and add more conflict? Be cautious here though, because you don't want to just have tasks take longer. Look for places where the stakes will also go up if the protagonist fails instead of succeeds. Or places where you can edit to raise the stakes if she fails. You want to maintain that sense of things getting worse and worse or you'll end up with a lot of "stuff" happening that doesn't move the story forward. Take a peek at your subplots. Are there any spots on your main plot line that can be made more complicated by braiding in your subplot? Can you deepen any of them to give something else in the novel greater meaning? Can they affect the stakes in any way? Look for spots where decisions are being made. Are the choices too easy? How can you make them harder? And not just physically harder, but emotionally tougher as well. Were there any spots where you started to go off on a tangent but reeled yourself back in? Those might be areas your subconscious thought would be fun paces to go, and there might be opportunities lurking there. Potential subplots could come from here. I know, sacrilege for me to even suggest it, but is there an element of the backstory that might be dramatized or illustrated to shed new or better light on something already in the novel? You don't need to add a full-on flashback, but a memory might cause a different action or response somewhere and take the story to a new place or offer a new obstacle to overcome. This seems like the easiest way to add words, but unless it's connected to the main storyline and woven in with the same skill and relevance as the other subplots, it often ends up feeling tacked on. Sometimes a subplot is the way to go, but make sure it fits and improves the whole story. Ditto here. Adding someone new throws all kinds of wrenches into the mix, some good, some bad. A new face might give you plenty of places to add some extra lines, but what do they add to the story? If that new characters don't bring out elements that were already there (but hidden) then you may just want to leave them out. The whole point in adding words to a short manuscript is to make it more interesting, not add words that are frequently skimmed by readers. Unless you have a novel that is truly sparse on description (and this happens, I do it all the time), don't load up readers with unnecessary details. The key thing to remember when you're bulking up a novel is to be true to the story. Look for ways to tell that story, deepen those characters, and keep the reader guessing what will happen next. Great post. I don't often have too little in my stories, but when I do, it can be hard to get around, because I'm so used to hitting the mark or going over. Thanks for some nice tips. Great article! I love your plot-check summary especially. I'm also quite intrigued by how well those four key plot points map to the "5 stages of grief" model of emotional response, which coincidentally I just finished writing a blog series on. Pretty sure I'll be revisiting this post in the revision stage, thanks for the thorough information! I'm definitely bookmarking this post! I'm a skeleton first-draft writer and these tips will come in handy on re-write. Thanks. 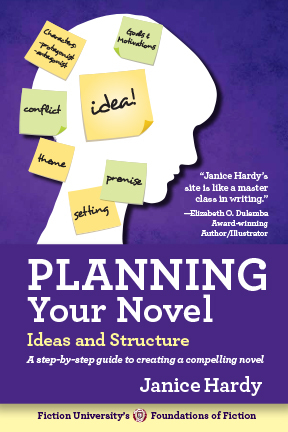 This is a great checklist for plotting. Thank you! I'm with Kristi and Jaydee. My first drafts have so many chinks that it's nothing but the framework for the house—and a shoddy framework at that. Handy checklist; thanks! Another fabulous post. This one is getting bookmarked. You don't know me from Adam, but you are my hero right now! Everyone and their brother talks about the opposite problem (too-long mss. ), but this is the best discussion I've seen of 'bulking up' -- just what I needed at this particular moment. Thanks! It'd help to spell things properly. Edited. I try to catch all the typos, but they tend to do slip in there. I missed this post last week--YES!!! Just what I needed, thanks! It used to be a problem for me. But for Manifestation Files, all I had to do was to promote one of the characters, and not only I have a romantic arc, a lot of conflict bloomed with some of the other characters, and the 2nd half was radically changed. I'm definitely a spare writer in the early going, then flesh out in revisions. I've always worked that way, and for me, it just helps with overall story structure to get that down, then go deeper. Thank you so much for this post! I'm the type to draft short and have to flesh it out, and just figuring out where I'm missing stuff can be daunting. Bookmarked for when I hit revisions! I am a chronically brief writer and constantly fall in the hole of "Maybe I should just make this a novella." My Nano novel is just the latest example. I had three points at which I thought... there's no way I'm going to make it to 50K. The worst was validating my Open Office 50K and finding it was only 48K. I KNOW almost everyone of the 2K I added to make the goal is NOT staying in, which just makes 70K that much more daunting. I know I have enough plot, so I just need to work the plot through. I'm bookmarking this one too. Usually this is not a problem for me (as you know, having had to wade through a couple of my doorstops...), but the novel I just finished is feeling a bit short. Usually I just dump everything on the page and then cut like a mad-women come revision time, cutting anywhere from 20-30%. But if I cut that percentage this time, I'll be real close to being too short. I'm hoping the shorter first draft is more a sign that I've learned to be less sloppy since that last novel and I won't have to cut so much this time around. If not, I'll be looking back here to figure out how to get my minimum word count. This was exactly my problem with nano! I need to add more back story and motivation. My MC is too like able! I want her to be kind of obnoxious until you learn her story. Helpful post! Jennie, that's my style as well. I like to get the action and plot down first and flesh it out after. Kimberly, you might try looking at your internalization and emotional character arcs. You might be able to flesh out a lot there if the plot is solid. I'll have first draft scenes that are all abut the what, but the why and how that why affects the characters is absent. I put that in and my scene is longer, richer, and more compelling. TL, grats on the short novel! I bet it is a sign. You learned so much on MSR and that had to show in your next project. I look forward to reading it when you submit it to the group! Jennie, too likable? LOL now that's one I don't hear often. But I LOVE that you don't want her to be perfect. I'm with Carradee--I couldn't find "The Shifter" at my local Barnes and Noble and found out they only have it online, not on the shelf. Boo. I'm thinking about asking if they can order it. That being said, this post was just perfect for me, especially regarding my NaNo novel (230 pages, not yet finished, and needs some definite fleshing). I'll save this post for when I go back and revise. Thanks, as always, for the useful advice! Aw, that's sad :( The B&N near my mother is like that as well (just kills me!). Good luck on your NaNo novel! Thank you very much for this post. After having a minor panic attack, this article helped me see the glaring holes in my first draft. One major problem was that I hardly described one of the main characters, which is saved by the others later in the novel. If the reader doesn't care about the character, why should my hero? And now to fill up those holes with words! Most welcome. Hope the bulking up goes well! Great post, but I can't understand the writers who like to go thin on the story at first, then go back and flesh it out. I revise, but I prefer most of the story and characters to be written out the first time around. It helps me to mold the rest of the story, if all the characters have their personalities and motivations already on paper. Plus I'm a bit of a perfectionist, and even if I know I'm going back to it later, seeing something that doesn't work bothers me. Everyone has their own process. I tend to wrote sparse and flesh out after because I want to get the basic story down first. If that isn't working, I don't want to spend a lot of time on text I'll end up changing. But one of my best friends writes more like you. She needs every scene to be right before she moves on to the next. Priceless. Especially the grim acceptance there in the last one. You have a solid summary, yourself. Oh my, I did almost everything you said I shouldn't do: added a new (secondary) character who sparked a new subplot. But his subplot also directly caused manure to hit the fan and propel my main characters into their climactic battle, so I guess it's all good. And I love your mottos for the major plot points! Their function is so easy to keep in mind now! Do you have the mottos for the minor plot points, too (esp. the pinch points)? It's not necessarily bad...just often not needed. If your novel benefits from something on the "don't do" list that's fine. Just be objective and make sure it's helping your novel and not hurting it. I tend to describe things in odd ways so there's probably of lot of it scattered among all the plotting and structure posts. Hi, Janice. Thanks for a very helpful post. 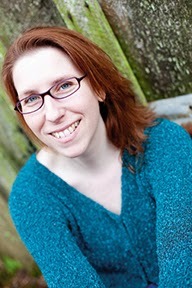 I've used a number of strategies in dealing with the problem of a too-short love: adding more description to characters and settings; adding scenes that provide deeper insight into the characters; throwing in a few unexpected plot twists; introducing a couple of offbeat (and fun) secondary characters. I should add, however, that none of these changes added unnecessary padding to the novel nor slowed down its plot. When you do them well they wouldn't. I just said be wary when you do those things, as they don't always solve the problem. If that's what the novel needs, they can work just fine. My story is so long, never thought I'd be interested in an article about padding. But, lately been thinking it might structure perfectly into a trilogy. If it still doesn't need cutting (yeah, that long), this post would come in handy. BTW - A book on "Polishing Your Novel coming in 2017! How exciting to have a consistent set of books to help through the whole process. I don't know how you do it all. I've done some articles on trilogies, so you might start with these and see if they help. A general suggestion--trilogies follow the same beginning--middle--ending format as a stand alone novel, so it helps to think of the three books as the three arcs of the larger story. Book one is all about discovering the bigger problem, book two is about trying to solve that problem and everything going wrong, book three resolves the problem. Of course, you need each book to have a satisfying story arc as well, but the overall structure works to help you decide what to put where.